KHARKAN (HOSHIARPUR), OCTOBER 09: Punjab Chief Minister Mr. Parkash Singh Badal today called upon the people of the state to take a conscientious decision in favour of any political party during the forthcoming assembly elections, which were just two-and-a-half month away only after giving due weightage to the comparative performance of the SAD-BJP regime in just four-and-a-half-year viz. a viz. Congress party\'s long tenure over 20 years in the state. Addressing the massive gathering after laying the foundation stone of the complex of the Guru Ravidass Ayurved University here, Mr. Badal said that what SAD-BJP government has done on development front in just short span of four-and-a-half years could not be even dreamt by the state Congress leadership. He said our government had made spectacular achievement in every sphere be it power generation, education, healthcare, infrastructure etc. whereas the Congress government was completely insensitive to the development issues. Lashing at the Congress for its apathetic and discriminatory attitude towards Punjabis, Mr. Badal said that it had always betrayed Punjab on every front, be it agriculture, industry and even on the infrastructure development. He said that Central policies and formulae were inimical to the interests of Punjab as they deliberately devised stringent parameters for the eligibility of the centrally sponsored schemes and grants to keep out our state from its ambit on one pretext and other. He lamented that the Congress party was unthankful to Punjab being the sword-arm and food bowl of the country while sanctioning Centrally sponsored schemes. Urging the leader of Opposition in Rajya Sabha Mr. Arun Jaitley, the Chief Minister sought cooperation from NDA being the major opposition party in the parliament to mount pressure on the Congress led UPA government to immediately roll back the recent hike in the prices of fertilizers, which had been doubled, for which state assembly had unanimously passed a resolution in this regard in its just concluded session. On the power front, Mr. Badal said that Punjab would soon become a power surplus in the country. He said that Punjab government had recently taken path breaking decisions to significantly improve its two core sectors of healthcare and education. He mentioned five new universities have been set up and three more have been issued the letters of intent. Besides 17 new degree colleges and 21 model schools have been established to impart quality education to our students. To corroborate his claim over unprecedented development in education and healthcare, Mr. Badal said that the GoI in its survey of health facilities and infrastructure across all the state in the country had rated Punjab as excellent. Likewise, the Punjab state had risen to third from 14th position in the development of education sector in India. The Chief Minister reiterated his commitment to provide the best medical care and diagnostic facilities to the people at affordable rates. He said the State Govt. had already spent Rs. 350 crore for setting up a network of district hospitals, sub-divisional hospitals and primary health Centre\'s equipped with the best medical infrastructure. Apart from this the state government had already spent Rs.394 crore for the up-gradation and renovation of government medical Colleges at Amritsar, Faridkot and Patiala besides Baba Farid University of Health Secience. He also pointed out that the Punjab government had set up two Max Super specialty Cancer and Cardiac Hospitals at Bathinda and Mohali in PPP mode at a cost of Rs.300 crore. On the occasion, the Chief Minister appreciated the efforts of the village panchayat Kharkan which had donated 33 acres of land free of cost for the establishment of the university and asked the Vice Chancellor of the university to impart free education of the wards of this village. In his address Opposition leader in Rajya Sabha Mr. Arun Jaitley said that the upcoming Guru Ravidass Ayurved University would go a long way in giving boost to the alternate system on medicine. He emphasized the need to encourage extensive research in the alternate medicine system like Ayurved, Homeopathy, Sidha, Yoga and Unani. He said that SAD-BJP alliance in Punjab had ushered in an era of unparalleled development in every sector especially the education and health. He said that the road and bridges infrastructures today Punjab was comparable with any developed state of the country. Speaking on the occasion, Medical Education & Research and Forests Minister Mr. Arunesh Shakir said that this university was being aptly set up in the forest region of Hoshiarpur which had abundant verities of rare herbs and shrubs with immense medicinal values. Local Government Minister Mr. Tikshan Sud said Guru Ravidass Ayurved University after the name one of the great saint of India who propagated the message of love, peace and harmony was a real tribute to Sri Guru Ravidass ji. 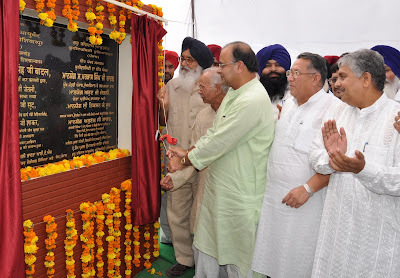 Earlier, the Chief Minister laid the foundation stone of the complex of the university, first of its kind in Punjab and fourth in the country, to be constructed over an area of 33 acre land and sum of Rs.20 crore would be spent on the first phase of construction out of total Rs.55 crore. Asked to comment on the possibility of the mid term polls in the country, Mr. Jaitley quipped: \'It could or could not be but Congress led UPA government may not last its full term because it has lost both the Centre of gravity and equilibrium\'. Mr. Jaitley was talking to the media persons on the sidelines of the function. on the occasion, Prof. Om Parkash Upadhay Vice Chancellor of Guru Ravidass Ayurved University welcomed the chief guest. Prominent amongst others who spoke on the occasion included President SC Morcha of BJP Mr. Dishant Gautam and MLA Mahalpur Mr. Sohan Singh Thandal and Sant Nirmal Singh. Mrs. Mohinder Kaur Josh, Mr. Sarwan Singh Phillaur and Mr. KD Bhandari (all CPSs), Vice Chairman State Planning Board Punjab Prof. Rajinder Bhandari, Chairman Markfed Mr. Jarnail Singh Wahid, MLA Banga Mr. Mohan Lal, former Minister Ch. Swarna Ram and senior Akali leader Mr. Varinder Singh Bajwa were also present on the occasion. Besides senior leaders and workers of SAD-BJP, Members of SGPC and various saints from different religious organizations were also present on the occasion.